"Reaching the Oregon Trail in Wyoming and not confronting the Mormon experience would be like reaching Paris and not studying the cathedrals. You cannot understand one without the other" (262). Addressing everything Buck writes about Mormons would take forever, so I just want to point out a couple passages. His account of visiting Martin's Cove, a historical site owned by the LDS Church, is hilarious. He makes some interesting points while telling a hysterical tale about his foul-mouthed brother trying to "put on his Mormon" for the visit. Buck has his criticisms about how the Church acquired and runs the site, but the brothers' experience there made me laugh 'til I cried. While Buck's comments about Martin's Cove were not entirely positive, his experience on Rocky Ridge—the highest point of the Mormon Trail and one made sacred because of the extreme hardship endured there by pioneers, especially during the 1856 crossing of the beleaguered Willie Handcart Company—made a believer out of him. The fortuitous appearance of two "Mormon angels" just when the Buck brothers needed them in order to cross treacherous Rocky Ridge seemed to convince them that indeed, they trod on holy ground. Of the experience, Buck wrote, "... I loved ... everything Mormon, that day on Rocky Ridge. Indeed, standing with them on the high rocks, I was a Mormon. Today, on windy Rocky Ridge beneath a hard blue Wyoming sky, I was Mormon" (309). 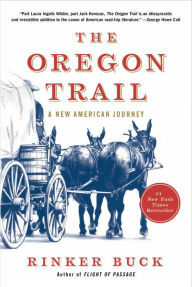 It's a very touching account, the most memorable part of The Oregon Trail for me. I haven't ever visited Martin's Cove or Rocky Ridge, but I still have a great respect and love for the pioneers whose blood and tears flowed freely over both. These men and women—some my own kin—endured incredible hardships in the name of religious freedom. In obeying the God they believed in with their whole hearts and souls, they blazed trails for all of us to follow. Vital to the settling of not just Utah, but also much of the American west, the magnificence of their courage and sacrifice really can't be understated.